A dear friend of mine just found out her mother has cancer and is starting chemo and radiation. So I’m making her a chemo cap. I finished one already but it’s not quite what I want for her. She’s a fine woman and deserves a beautiful hat. Why do so many chemo caps lack beauty?! It’s bad enough you’re fighting for your life but you have to wear an ugly hat too? Insult to injury. And then I found this one. Elegant and simple. Perfect! Free pattern to boot. I’m still sending her the first I made because she was on my heart when I did it but this one will soon follow. 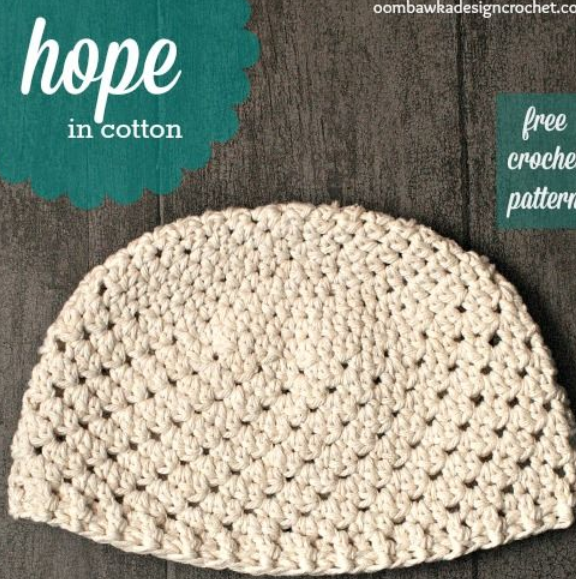 This entry was posted in Uncategorized and tagged beautiful, cancer, chemo cap, crafts, crochet, free pattern, hat patterns. Bookmark the permalink. ← What in the Name of Pixar?? ?